Ceviche is something we love to entertain with. Popularized in Latin American countries, it’s basically any form of seafood marinated in citrus. While Peru may be the birthplace of ceviche (also spelled cebiche or seviche), many Latin American countries have also added their own accents and variations. We love it for the simplicity, fresh flavors, as well as the limitless possibilities to be creative. 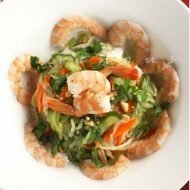 We love the combination of shrimp and scallops, but you can use any fish, shellfish, squid, or octopus. In terms of citrus, lime or lemon are the most commonly used, but you can use any fruit juice that has some acidity, including pineapple, grapefruit, orange–or any combination of these. The length of time you marinade the proteins in citrus is really dependent on the quantity, quality, and your personal tastes. If you have small amount sashimi grade fish, you would be perfectly fine with marinating it for only minutes. We typically make a large batch so we marinate ours for at least an hour. The key to even cooking of the proteins is that all the pieces of shrimp and scallops should be about the same size. 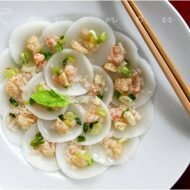 If you’re using bay scallops, cut the shrimp to equal size. If you’re using diver scallops, cut into small cubes and similarly cut the shrimp the same size. The smaller the pieces, the quicker it will “cook” but don’t cut it too small. Add about 1 and 3/4 cups of lime/lemon juice in mixing bowl with the prepared shrimp and scallops. Mix well and press a sheet of saran wrap over the mixture to keep it submerged. 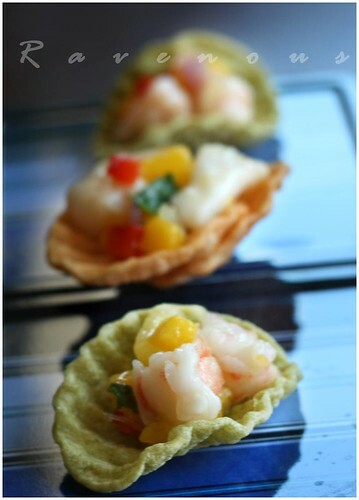 Refrigerate for about 1 hr or until shrimp and scallops become opaque. In the meantime, prep the red onions, mangos, red bell peppers, jalepenos, and mint leaves. When shrimp and scallop mixture is ready, drain the citrus. Toss in the red onions, mangos, red bell peppers, jalepenos and mix well with the remaining 1/4 cup of fresh lime juice. Now add Kosher salt or fresh cracked sea salt to taste as well as fresh cracked pepper. Finally toss in chopped mint and serve. Common accompaniments include plantain chips, tortilla chips, and even popcorn. We had these great crispy veggie tomato and spinach chips that we got at Costco. Seems to be a healthy option to check out. Nicely done! 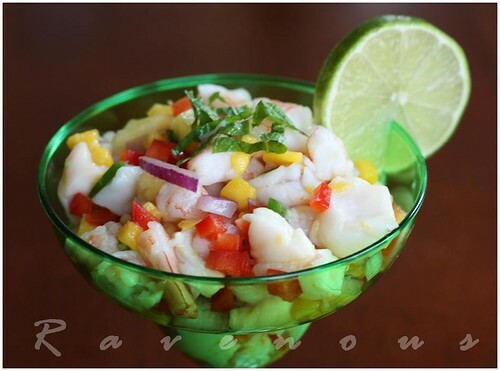 I love Ceviche Beautiful photos as well. I've never had ceviche, but you've inspired me to try it. lone acorn: it's totally healthy and delicious! Hummingbird: Try it and post! 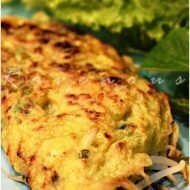 What a refreshing low carb summer meal! Any idea how I can replace the mango? 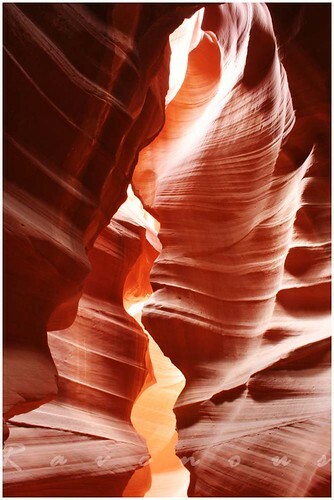 Beautiful photography as well! Glad I found you at Tastespotting. Lauren: Thank you for discovering us! Mango is definitely not a requirement. You can go without out or replace with pineapple, tomato, or avacado…possibilities are endless really. What a beautiful ceviche! 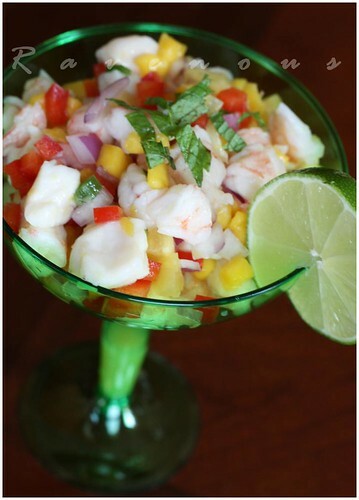 I love the combination of shrimp and scallops and mango is a great addition here! 5 star: thank you! it's so flexible…Peruvian style ceviche has sweet potato and corn! Love it scooped up on that veggie chip! Makes me think of Vietnamese chop salad (goi tom) that you scoop with shrimp chips. nikki: you're absolutely right..it does look like the shrimp chips–while great, these are definitely healthier. Wow this look colourful and delectable. Thanks for this toothsome recipe. I love it. It was delish. Every summer my family chooses a country and completely immerses into it – learning history and culture, reading the literature, watching films, and we make all of our meals from that country. I love your recipes! I’ve been using them all summer long! Thank you for sharing.